I choose the theme COMPLETE for today's challenge post because as I promised - I finally completed these eagles that I started from Fall of last year! That one was a doozy time-wise...I had wanted to complete it by his birthday in January, but wasn't completed until February so I gave it to him for Valentines day! Peyote isn't something I can rush. I worry about knots in the thread, perfectly culled beads, messing up the pattern and so on. It is a technique that I've learned you just need to take your time to complete some projects. 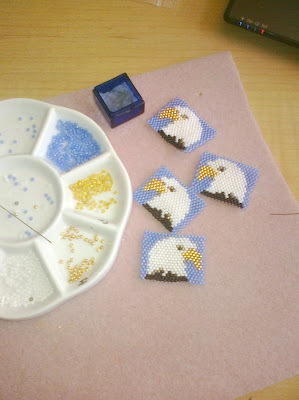 Although some of my fellow bloggers whip out amazing peyote creations pretty darn fast! In a strange turn of events, while I was working on this post this morning, my best friend sent me this link today and I've been mesmerized since! It's AMAZING - and LIVE - and you can see the eaglet chicks if you are watching at the right time!!! It is the C day in the A-Z challenge, but after previewing this post I wonder if I maybe should have posted all this on the E day! I have absolutely no talent at all when it comes to any form of handcraft, so I'm always impressed when I see things like this. I take my hat off to you (shop-bought, of course, seeing as I don't knit;p). This is beautiful and something I would love to learn! 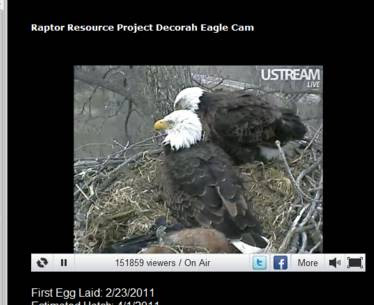 Oh for the first time we have a nesting pair being webcamed (is that a word?) in our area and it is awesome. We also have nesting falcons on one of the buildings in the city we can watch. I love nature. 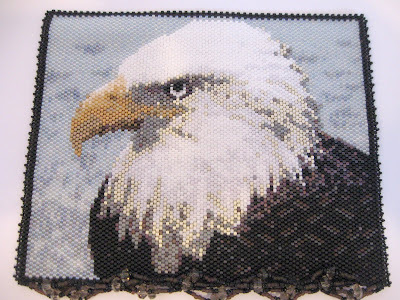 Hey that eagle is gorgeous it reminds me of a wolf cross-stitch that took me forever to complete.